The piece is now for sale at this link! 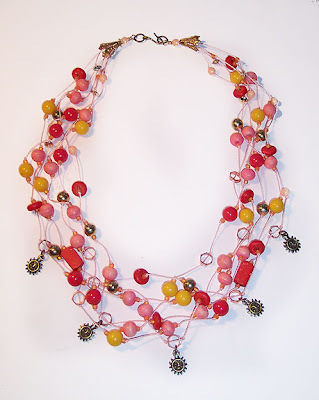 I made this necklace for the Stringing Magazine quarterly challenge. The deadline for this challenge was Feb 4, so if you missed it, be on the lookout for the next one! 1 Turn loops on the ends of your two pieces of wire. Turn them a bit past a full loop so that they will be secure. 2 Fold each of the long stands of C-Lon in half and string each through one of the loops. Knot each doubled strand and slide the knot up tight against the loop with your tweezers. Dot each knot with cement. 3 Add the beads randomly to each strand, aiming for a pleasing mix of colors and sizes. Stagger the placement, and leave about an inch to an inch and a half between each bead, knotting before and after each to hold them in place. For large holed beads, use 8/0 seed beads of each side to keep them from slipping through. Spread the metal throughout the piece as accents. 3 At the end, thread the cords by pairs through the loop on the other piece of wire. Tie a knot around the necklace strands and pull snugly. Glue your knots with the cement, and trim them when the cement has thoroughly dried. 4 Slide the cones down over the wires, hiding the knots. Add a bead to the wire end and make a wrapped loop. Add a large jump ring to each loop and attach a hook to one.